If you are looking for the best quadcopter with a camera, you’ll want to keep an eye out for certain key features that set it apart. For their technological sophistication, convenient stabilization, dynamic media capturing capabilities and user-friendly controls, the following quadcopters are some of the best available on the market today. You will find affordable drones with Wifi or HD camera, and live video features, for both indoor and outdoor use. The U818A quadcopter is technologically sophisticated enough to satisfy experts but intuitive enough to be user-friendly for beginners as well. The drone is designed with an adjustable 720p HD camera that operates at 30 frames per second. The U818A quadcopter features first-person view (FPV) mode. So, the owner can get a live point of view from its camera’s perspective on their Android or iOS mobile device. With a price tag of around 100 dollars, the U818A is one of the best affordable quadcopters with HD camera. This drone is suitable for outdoor flying and has a flight time of 6-9 minutes. With its headless mode, beginners can have an easier time controlling the U818A by locking all of its movements into unconditional synchronization with the remote control. The Gravity Induction app allows the owner to make the quadcopter fly in whatever directions to match the angle of their mobile device. The U818A drone is powered by two 3.7V 700mAh LiPo batteries and operates with a 2.4 GHz controller. The Syma X5C quadcopter is an agile model that is capable of aerodynamic stunts with wind resistance and flight stabilization. 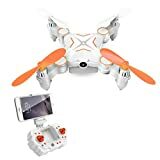 The drone features an HD camera that can take pictures and videos while performing sharp turns or flips, making it a fine candidate for the best quadcopter with camera suitable for dynamic media. The color-coded flashing lights embedded in the drone’s body allow owners to fly it at night while maintaining more visibility. The Syma X5C can be purchased for less than 50 dollars, so it is one of the cheapest quadcopters with camera. This drone is suitable for both indoor and outdoor flying. It has a flight time of approximately 7 minutes and is equipped with 6-axis gyro stabilization to optimize its steadiness in midair. The Syma X5C quadcopter operates with a 3.7V 500 Mah Li-poly battery and is flown with a 2.4 GHz remote control. The MJX400 quadcopter was implemented with modern 6-Axis Gyro flying control technology to keep it stable and capable of completing 3D roles with a single key. The best quadcopter with camera integration is one that is adjustable to match aviator experience levels. The MJX X400W conveniently delivers well in this category. This drone is made with advanced features for experienced owners but fundamentally designed for a low learning curve that beginners can quickly adapt to. Some of the key features of this quadcopter include a 3D split screen display, FPV real-time transmission, and a high capacity battery that allows you to control the drone from as far as 100 meters away. The price range for the MJX X400W quadcopter is $70.00-$90.00, so this is another affordable option for the best camera quadcopter. This drone can be shifted into a headless mode so that the multi-rotor has its direction committed to that of the remote instead of the direction of the drone’s nose. The MJX400W is for outdoor flying and can stay aloft for 8 to 9 minutes. A single 3.7V 500 Mah Li-poly battery powers the drone and three AA batteries power its control transmitter. The Cheerwing Syma X5SW-V3 quadcopter is a suitable choice for owners who want to take advantage of its smartphone-friendliness. With support for all Android and iOS phones in FPV mode and a cell phone holder, the Cheerwing Syma is an example of the best quadcopter with camera that you can use for personal photoshoots. This model was designed for one key 360° roll capability, and a 3D lock feature to accommodate those who enjoy taking dynamic aerial videos. The drone’s headless/IOC feature shortens the amount of time that new owners need to take to get acclimated to it by syncing the multi-rotor direction with the remote controls direction. The Cheerwing Syma X5SW-V3 is available in a price range between $45.00 and $50.00. 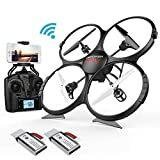 It is the best cheap quadcopter with Wifi camera. This outdoor drone’s 6-axis gyro flight control on four channels increases its stability while flying in unstable wind conditions. Owners can control the drone from an RC distance as far as 50 meters away for a flight time of 6-7 minutes. The Cheerwing Syma X5SW-V3 works with a 3.7V 500 Mah Li-poly battery, and its controller operates with four 1.5V AA batteries. The Holy Stone F181 RC Quadcopter features an optional Altitude Hold function that keeps it hovering after the owner releases the throttle stick, potentially making it easier to take static aerial photographs and videos. The drone features key 360° 4-ways flip capability and continuous roll functionality. This quadcopter has a fairly generous range of up to 100 meters. The quadcopter has both a key return feature and a headless security system to cut down on the chance of accidental loss on the field. The Holy Stone F181 RC quadcopter’s price range is around $100, so it is a good option for the best quadcopter with camera under 200 dollars. 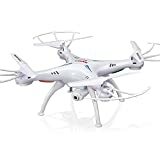 This drone is suitable for both indoor and outdoor flying with an approximate flight time of 6-9 minutes. The Holy Stone F181 RC quadcopter requires a 3.7V 500 Mah Li-poly battery to operate and comes with a 2.4G remote transmitter. The Rabing Mini Foldable RC Drone is an easily portable model that is compact enough for the owner to keep it in their pockets. Owners can get a new perspective on the real-time drone video transmission experience by placing their phone into the VR box or using their own VR glasses. Without using the quadcopter’s VR technology, owners can still take pictures and record videos with its HD 0.3MP camera. Owners can link Rabing’s downloadable app to M1 Wi-Fi to control the drone with their iOS or Android smartphone. 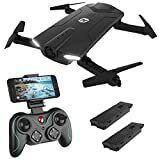 The Rabing Mini Foldable RC Drone is available for less than 50 dollars, being a reliable option for the best cheap quadcopter with HD camera. The Rabing’s 2.4GHz remote control frequency has been optimized for a greater level of resistance to mid-flight interference. The drone’s maximum flight duration when fully charged is between seven to ten minutes. The remote control requires four AAA batteries and the quadcopter itself requires a 3.7V 220mAh battery to fly. As such, it is also a good choice for the best remote control quadcopter with camera. 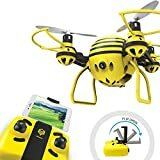 The Hasakee H1 drone, fashioned in the image of a bumblebee, is suitable for beginners and children without any compromises made in terms of technological sophistication. The drone operates with 2.4 GHz technology and 6-axis stabilization functionality to keep it stable in flight. With its inbuilt air pressure sensor feature, this FPV RC drone can automatically determine the optimal flying height to maintain. The drone can capture videos and pictures with its FPV HD camera, and provide the owner with a live video feed on their Android/iOS smartphone via Wi-Fi. The drone’s speed is adjustable to match the skill level of the aviator. Experienced owners can freely set the drone to high speed while beginners can have an easier time controlling it with its headless security mode. 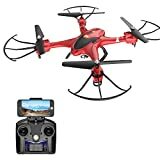 The Hasakee H1 drone is available for less than 50 dollars, being another good option for the best cheap quadcopter with HD camera. You can use this drone both indoors and outdoors with a maximum flying time of about 10-12 minutes. The Hasakee H1 drone operates with a 3.7V 450mAh battery, and is controlled with a 4-channel, 2.4 GHz transmitter. You can take amazing aerial photos and videos with this FPV RC drone from Holy Stone due to its 720P HD camera. The FPV function allows you to watch live videos and snap photos right on your smartphone. The quadcopter has many user-friendly features, such as one-key start/landing, altitude holder, and app control system. As such, it is a good choice if you are looking for the best quadcopter with camera for kids or beginners. The blades are foldable, so you can easily make the drone portable and toy small. The quadcopter operates on 2 powerful 3.7V 500mAh Modular batteries and has 4-speed modes to match all skill levels. You can also fly it at night, as it is equipped with LED navigation lights. With a price tag around $100, it is a solid option for the best quadcopter with camera under 200 dollars. This 2.4 GHz 6-axis gyro RC quadcopter comes with many cool, beginner-friendly features such as headless mode, one key return, and low voltage alarm. The drone is equipped with a 720P HD camera that will allow you to capture amazing aerial photos and footage. 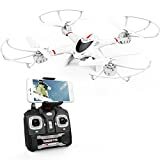 This best quadcopter with camera is particularly appealing to kids due to its 360° flips function which makes it extra fun to fly. When ordering this drone, you will also get a bonus battery to double the flying time. The drone is suitable for both indoor and outdoor use and recommended for beginners. When you are considering what the best quadcopter with camera model may be to buy, make sure to use the above models as a baseline. Whether you are a pro or a beginner, the ideal quadcopter with camera features should be calibrated to match your skill level. Top-shelf camera quadcopters are those that have features in place to make them more stable in flight, visible, easily maneuverable and seamlessly compatible with smart technology. If you have any questions about choosing the best quadcopter with camera, feel free to get in contact with us.